THE SCENE: Every black man I know has been hassled by a racist cop. And you know what? We have it easy. Imagine living in America before civil rights legislation, when “colored-only” water fountains were plentiful and legal. Now imagine growing up in the 1950s as the child of black, white and Puerto Rican ancestry. 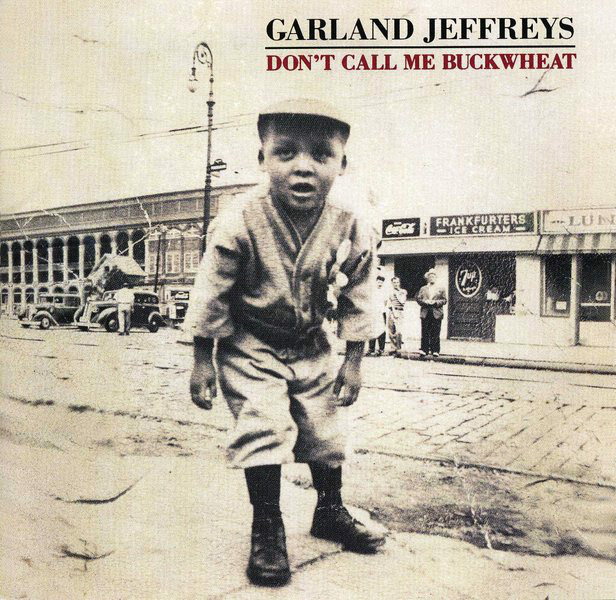 That is the reality of Brooklyn singer-songwriter Garland Jeffreys, and two decades into his recording career he delivered a concept album about surviving racial intolerance, 1992’s vulnerable Don’t Call Me Buckwheat. Remixing rock, reggae and R&B as rhythms from related recipes, he recants tales of his life and the role racism has rendered. As a boy the light-skinned blue-eyed Jeffreys occasionally passed for white (the flamenco-styled “Spanish Blood) when he wasn’t being stared at like a carnival attraction (in the cocktail jazz of “Racial Repertoire”). He fully understands the loneliness of being a black man in a white man’s arena (the skanked-up “Color Line”) and the tools one can use to forget the injustice (the skanked-down “Bottle of Love”). Sadly, this song was inspired by a trip he took to Shea Stadium. In the 1990s. THE FALLOUT: Buckwheat sold nearly half a million copies in Europe, where he’s continually had strong success. Meanwhile back in the U.S.A. his domestic label gave him the moist handshake of indifference and abandoned the album, despite unanimous critical acclaim. Don’t Call Me Buckwheat dramatically draws the humane conclusion that despite the machinations of racism all people are, and will continue to be, equal. And so it shall be. This was just posted last Wednesday, and I must say I’m very moved by this piece. Mark French, whoever you are, I thank you very much for shining a light on this album. While it was a great success in Europe as you say, my hope is that it will be re-released in the US once again, and perhaps reach it’s audience. We have the album and love it – the other albums as well. He can sompose – and perform – in many stlyes. Really a neglected American artist. If not the most significant recording of the 90’s. A damn shame that the record company didn’t do right by it; but it’s obvious why, and that’s unfortunate. I have been a Garland Jeffreys fan since the 70’s. This recording is paramount in music and in the world. Being of a multi-racial background similar to Garland’s, I hugely identifiy with this record. It is beautifully written, produced and performed. I hope it is re-released; I know if it is, it will make a BIG NOISE and deservedly so. Rumour has it that Garland Jeffreys is working on a new album and will be touring again. Let’s hope so! A live version of Don't Call Me Buckwheat is on YouTube – fantastic song and performance by Garland Jeffreys and band!